(Charles City, Virginia) – With the 2016 presidential election fast approaching, Westover Church, one of the oldest churches in the United States, is inviting you to learn about the presidents of the past, while celebrating some of Virginia’s most historic and unique architecture. The Autumn Pilgrimage House Tour, organized for decades by Westover Church and held this year on September 17, is a tour of historic and significant Charles City homes and gardens, some of which are open to the public for this one day each year. The tour includes the homes of John Tyler, William Henry Harrison, and Benjamin Harrison. Westover Church itself has presidential history as well. George Washington and Theodore Roosevelt both worshipped there. Westover Parish was formed more than 400 years ago near the site of the Jamestown settlement. The church structure was completed in 1730 at its present site on Herring Creek. 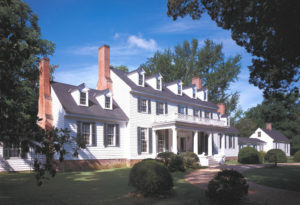 Berkeley Plantation: Built circa 1726, this plantation was the site of the first Thanksgiving and was the ancestral home of U.S. Presidents William Henry Harrison and Benjamin Harrison. Sherwood Forest Plantation: Home of President John Tyler, this plantation home was begun circa 1660 with additions through 1845. Westover Plantation: Built circa 1730, Westover Plantation is considered one of the most perfect examples of Georgian architecture in America. Westover Episcopal Church: 400 years old and going strong, this church is home to one of the most historic parishes in the nation. Belle Air Plantation: One of the oldest surviving frame dwellings in America, this home was built circa 1700. The original property was purchased in 1662. River Edge: A restoration work in progress, this plantation was built circa 1790. Visitors will see with their own eyes the considerable work that is being done to bring this historic property back to its former glory. Glenns: One of the more unique homes found anywhere, this home has only two right angles in its structure. It was constructed with hand-hewn beams recovered from local barns and churches and is filled with family antiques, paintings and whimsical sculptures. Lazare Gallery and Wurdeman House: Lazare Gallery is a 6,300 square foot building containing the West’s foremost repository of paintings from the Moscow School of Russian Realism. The collection is maintained by John and Kathy Wurdeman, who live in the adjacent residence. VCU Rice Rivers Center: The Virginia Commonwealth University Rice Rivers Center is a field station devoted to environmental research, teaching and public service. The facility collaborates with environmental agencies to study river ecosystems, water quality and the environment. Advance tickets are $35 and may be purchased online at https://www.eventbrite.com/e/2016-autumn-pilgrimage-house-tour-tickets-24737967928 or by calling 804-829-2488. Box lunches are also available for pre-purchase. Advance ticket and box lunch sales begin June 15. Advance ticket sales end on September 16, while advance box lunch sales end September 14. Tickets may also be purchased on the day of the tour at Westover Church for $40. Pulled pork barbeque and Brunswick stew can also be purchased on the day of the tour. The house tour generates funds for Westover Church’s Meals on Wheels program and other area social services programs.